Maroon and salmony reds accented with bold greens and punctuated with snowy white patches combine to transform the U.S. Capitol into a magical holiday landscape. Inside, a straightforward but heartfelt greeting of "Wishing you all the joys of the season" appears in Liz's handwriting. 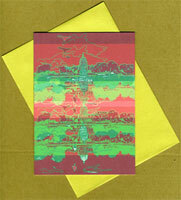 You also have the option of choosing one of nine other greetings (pdf 329k), to make the card just right for you. The back of the card features a short but wonderful quote from Theodore Roosevelt in type: "It is always better to be an original than an imitation ..."
This elegant card is printed on bright white recycled paper and paired with an equally elegant envelope gold envelope. Who needs presents with a card like this? Sets of 8 are packaged in kraft box with clear lid.